New and amazing deals are carefully selected each month by our editors. This month we have great holiday meal bargains, from expertly baked pies to a cranberry sauce based on a Colonial-era recipe (right). New Get 25 percent off any whole turkey from D'Artagnan, including organic free-range, heritage breed and American wild turkeys. Pre-orders will be available through Monday, November 23, and turkeys will be delivered on the Tuesday and Wednesday of Thanksgiving week, November 24 and 25. Turkeys were originally from $65 for a 8-10-pound turkey, now from $49. Valid November 1-23, 2009; use discount coupon code "FWTURKEY2009" at dartagnan.com while supplies last. New Get 25 percent off a set of eight three-inch tarts available in such flavors as pumpkin, macadamia, chocolate, chocolate raspberry, lemon and passion fruit. The tarts were originally $36, now $27. Valid October 1-November 30, 2009; mention “Food & Wine” when ordering at 860-927-1818 or info@daphnebaking.com; daphnebaking.com for more information. New Get 20 percent off select pies from Little Pie Company, including pumpkin pie and Southern pecan pie. The pies were originally $65, now $49. Valid October 1-November 30, 2009; use discount coupon code "FW" at littlepiecompany.com. New Get 25 percent off the “All-American Thanksgiving Selection” of artisanal American cheeses from New York’s oldest cheese shop. The selection includes Vermont cheddar, Virginia Grayson and a buttery, double-cream cheese from Georgia. The selection was originally $60, now $45. Valid October 1- November 30, 2009; use discount coupon code “29FW1011” at murrayscheese.com. 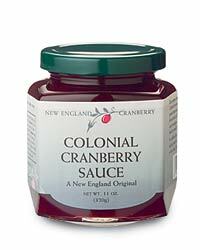 New Get 25 percent off all New England Cranberry products, excluding its maple syrup. The discount applies on all of New England Cranberry’s chutneys, fruit spreads and sauces, like its Colonial Cranberry Sauce, created from a colonial-era recipe. The cranberry sauce was originally $6.50 for a 12-ounce jar, now $4.88. Valid October 1-November 30, 2009; use discount coupon code “FW” at newenglandcranberry.com. Get 25 percent off the Fall Selection Classic cheese board from Fromages.com, which includes five classic French cheeses such as Cavet Feuille goat’s-milk cheese and Bleu d’Auvergne cow’s-milk cheeses. The selection was originally $60, now $45. Valid September 1-October 31, 2009; fromages.com.